As a fan of pirate music, I often find myself amongst the villainous and off-key. Pirate music is commonly gritty, sinister, and more concerned with setting a swashbuckling mood than achieving musical perfection – and God love ’em for it! That said, once in a while it’s good to rise up from the bilges, sober up, maybe take a bath, and listen to some artists that have opted for a different, more polished musical endeavor. And that’s where Bounding Main is time and again a favorite amongst so many shanty-fans. 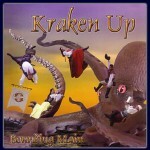 Kraken Up is Bounding Main’s fourth album, and carries a quality and tone that will come as no surprise to those familiar with their previous work. Primarily a capella, light-hearted, sometimes goofy and sometimes gorgeous – this is the Bounding Main that fans know and so fervently love (Bounding Mainiacs are indeed some of the most loyal fans I’ve seen amongst the pirate community.) The album begins with Dogger Bank, a song that seems to be in English, but has all the apparent intelligibility of a Yahoo Serious Festival. Twigger? Juvee Ju? Shangaroo??? The liner notes claim this is a traditional piece using actual sailing lingo, and I’ll have to take their word for it. The song itself – confusing wordage notwithstanding – is a joy to listen to with strong female lead vocals and deeper backup vocals keeping the pace. The album’s traditional selection includes the beautiful Le Capitaine De Sait-Malo which, like Dogger Bank, might sound like jibberish, but is actually something called “french.” Saltpeter Shanty has a fine strength about it, and David’s deep lead vocals – as always – contrasts extraordinarily well with the rest of the group’s backups. Sloop John B, which is partly traditional, partly original, is another beautiful piece that captures Bounding Main at its lyrical best, while also showcasing Gina’s ability to inject an extra emotional punch when she takes lead. Bounding Main is one of those groups that I hardly need review – the vast majority of readers probably already own their CDs, and will (and certainly SHOULD) rush out to buy Kraken Up. Granted, it contains not one direct pirate reference, but it features plenty of nautical appeal, and is certainly a joy on the ears. This entry was posted in Music and tagged bounding main, shanties by Bilgemunky. Bookmark the permalink.